Only gardeners know how truly exciting greens can be. After months of cold weather, they’re some of the first seeds to go in the ground and the first harvests of the new season. Plus, when you grow your own greens you have access to so much variety. Here are 10 unique varieties for those still adding to their spring planting list. Like the name suggests this plant is grown in water! Though not popular as a salad ingredient until the 1800s, watercress has a long and storied history and was used by the ancient Greeks, Romans, and Persians. 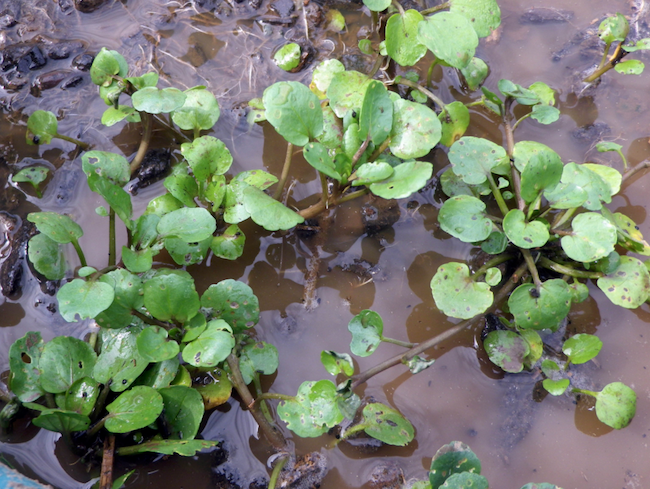 It has mustard-like flavor and can be grown in a cool stream or even a pot if you continually add fresh water. This North Carolina heirloom is milder and more tender than other collard varieties. It has yellow-tinted leaves that form loose heads. Cabbage collard seed can be hard to come by, this variety was shared with SESE by Benny and Vickie Cox of the Collard Shack! A beautiful, insect-resistant variety, red giant has well-savoyed leaves that are predominantly reddish-purple with an undercoat of green. It has strong mustard flavor, good cold tolerance, and is ready to harvest in 43 days. This lettuce was chosen by NASA for space farming and was the first vegetable to be grown and eaten on the International Space Station! Ready to harvest in just 64 days this variety has dark red, ruffled leaves that form loose heads. It was bred by Frank Morton of Wild Garden Seed. 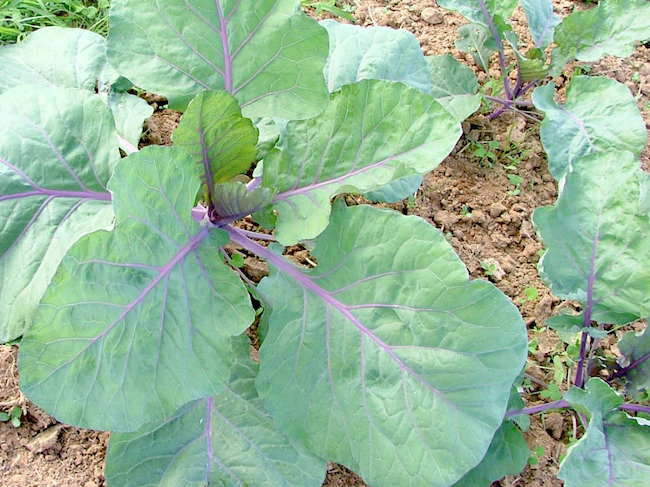 Collards may not be a unique feature to gardens of the mid-Atlantic and southeast but this blue-leaved heirloom is actually rather rare. The plants are smaller than other collard varieties so they can be spaced closer together. The leaves are green, blue-green, and purple with white, pale green, and plum-colored veins. This heirloom is a German variety dating back to the 1800s. It has long, narrow, silver-green leaves and is extremely cold-hardy, withstanding subzero temperatures. In warmer areas, this kale can live for many years and grow as high as 5 feet tall! This adorable lettuce produces apple-sized heads that are great for small gardens. It also matures fairly quickly, being ready to harvest in as little as 48 days. Tom Thumb has tender leaves and is a pre-1850 heirloom. Ruby Streak’s lacy leaves are a wonderful addition to any spring salad. In cold weather, the leaves are predominantly purple but are purple and green in warm weather. Ready to harvest in just 40 days this mustard’s spicy flavor also does wonderfully in stir-fries. This lettuce has a unique appearance and flavor! It’s a Taiwanese variety with long, thin, pointed leaves. It’s sometimes used in cooking as well as in salads and has a distinct flavor with hints of almond and clove. Though rainbow chard may be more popular this Italian variety actually has sweeter, more tender leaves than other varieties. It has white stems with glossy green leaves which can be harvested for baby greens at 25 days or for mature leaves at 50 days. 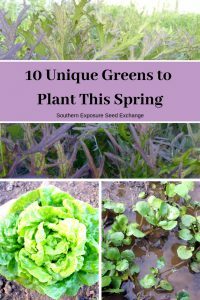 Even if you just planted greens you could have a garden full of variety. The name “greens” is pretty deceiving with the abundance of shapes, colors, and textures that different varieties offer. This is just a small sampling of some of the great varieties that work well for spring planting. You can find more in our greens and lettuce sections.